On Thursday and Friday last week I attended Web Directions South 2008, my first web only conference in a while. Overall it was a good event, but like most conferences there were some up & downs. Probably the biggest two downs were the opening Key Note and the lack of coffee on arrival on Friday morning. The biggest ups were Mark Pesce’s closing Key Note and David Peterson’s Semantic web for distributed social networks presentation, followed closely by August de los Reyes from Microsoft. So did I get an ROI for my $1,500 investment (conference fees, airfare and miscellaneous expenses)? I got to meet a large number of people face to face for the first time after communicating online with them for so long. I meet a large number of new people, I tried to average 5-10 new people per day. Mark Pesce’s talk, as always, was inspiring. David Peterson renewed my hope that FOAF and the Semantic will infact become a reality. Laurel Papworth reinforced that yes social media can make money. Data visualisation done well is also cool! There is lots of cool tech stuff going on in Melbourne, just not sure why I had to go to Sydney to find it. I learnt a fair bit on presentaion style, what works and what really doesn’t. Connections with several people that might turn into paying business, which is great. Finally there are a lot of books I need to read. The telling fact is will I come back next year. Probably yes. Arrived in Sydney late Monday evening for a very busy week, lots of meetings, attending Web Directions, Port 80, AussieTUB, presenting at a user group on Change Management and sitting on a panel for the NSW Knowledge Management forum discussing the value of social media and networking for business. During Web Directions I might live blog the sessions just not decided at this stage if there will be value for my readers. If I don’t live blog it I will cover the event on Twitter. For the talk on Change Management I am trying to new presentation style, even got myself one of those fancy remote presentation clicker things, and to make things more interesting the talk is to a group of HR professionals, who should be by all accounts experts! My talk is a summary of the 1 day workshop I have put together on Change Management taking the audience through the need for change management and a structured approach for implementation. The slides will go up on SlideShare afterwards if you want to have a look at them. Posted on September 24, 2008 by Michael SpechtPosted in Change Management, GeneralTagged NSW KM Forum, Sydney, WDS2008. Following the success of Startup Camp in Sydney, it’s on its way to Melbourne 3-5 October. It’s a get together of people from different disciplines that have an interest in startups and do a complete startup in one weekend. From coming up with the idea and making a business plan to pitching, design and development and marketing. I am helping the guys organise the event and right now we are full, 30 people registered, and have a waiting list of about 6 people. Unfortunately at this stage we do not have a venue, but we are working on it! We are also looking for sponsorship in the form of food and drink, if you know anyone who could help on this front that would be great. Posted on September 21, 2008 by Michael SpechtPosted in TechnologyTagged startup camp. Over the last couple of weeks I have been working on a couple of small side projects, one of which is a services to get your Direct Messages and @Replies sent directly to your mobile phone via SMS, Tweet2SMS. Basically this is to replace the service that Twitter shutdown about 3 weeks ago for users outside of the US, Canada, UK & India. The service has been running in a private beta for a couple of weeks and earlier this week I opened the beta up to anyone who wants to register. You still need to request an invite code, but they are distributed automatically based on service volume every hour. Account On – Turns your account on. Optional parameter for the number of hours you want your account on or the word Today which turns the account on until 3am the following day. Track On – Turns tracking of @Replies to your user name on, a word of warning if you are popular you will run out of SMS credits quickly. Optional parameter for the number of hours you want your account on or the word Today which turns the account on until 3am the following day. Track Off – Turns tracking off, you get the idea. If you are a Twitter users and need an SMS service go try it out. A couple of weeks ago I spoke to Beverley Head a freelance journalist about recruitment and web 2.0. Today the Australian Financial Review launched their IT Innovations special report with Beverley’s article quoting me. While the article is primarily about KPMG’s virtual career fair that kicks off later this month, I do end up with two paragraphs, not bad really and she mentioned Inspecht which is the best part. Unfortunately AFR run a subscription only online model so you can view the article on the AFR website, only if you have a subscription, I went & bought a physical paper to read it. Oh and for those interested yes I did research Beverley online before agreeing to speak with her. Australia is ranked 5th on the list with more Australian organisation being listed every day. I took a run through the top 10 BRW organisations to see who was listed, all were but not all have reviews. If you work for an Australian company join up and add your thoughts. As part of the global expansion you can now review salaries by country and in local currency making Glassdoor a great research tool for job seekers. For example looking to work at Telstra, Google in Australia, IBM in Australia, or Deloitte’s? I wonder how long it will take for Australian job boards to provide links directly to the company reviews? Certainly for referral tools such as 2Vouch and Hoojano it would be an important feature to help referrers understand the reputation of the company they are referring people to. I was reviewing the Optus careers web site and went to review a listing of jobs and I opened the third job listed within the IT group, one for a Business Intelligence Architect. 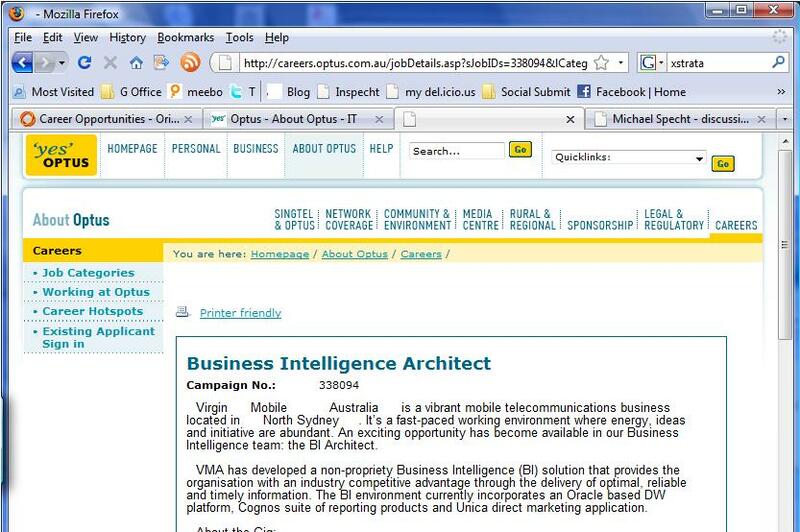 On the surface this is very strange, what is a role for Virgin Mobile doing on the Optus careers site. Now after a bit more digging I found out the Virgin Mobile is now a wholly owned subsidiary of Optus, which sort of explains things. But then again it does not. Human Capital: Virgin has such a successful consumer brand – has this translated to your employer brand? Angela Foskett: Absolutely. The consumer and employer brand are directly linked. People’s perceptions are very much the reality when they come in so there isn’t a massive culture shock. In most cases it’s better than people expected. Basically the two mirror each other and the culture and environment are the key focus to retaining that connection. We’re fortunate in that any brand research that we do can be used from a people perspective and from an internal brand perspective as well. It’s about the external brand and how that feeds back into organisational behaviour and how that feeds into individual behaviour. HC: What benefits have you seen from a strong brand? Does it help with attraction of candidates? AF: We recognise we’re not for everybody – that’s fine. The strength of the brand means we do get a lot of expressions of interest whether it’s ad-hoc or tied to an actual ad. People are really engaged in the ads we do write and they’re motivated by that. We’ve got a very successful referral program as well, and I guess our challenge is to ensure the cultural fit continues alongside our recruitment philosophy. When we have technical roles where we require a certain skills set they can be hard to fill because we don’t compromise on that cultural fit. It’s 60% about cultural fit and 40% about technical ability with the belief that we can upskill people. To me it is a very strange method of keeping a strong brand, not confusing candidates and making sure you are attracting the right cultural fit. It has been speculated for a long time that Google was going to enter the browser market, well on Sept 2nd they did with the launch of Chrome. Now there is lots written by the tech community on the launch about the pro’s and con’s of the new browser so I am just going to plot some of my thoughts. My first thought is on browser support, Chrome adds yet another browser for developers to support. Well sort of. Google have built Chrome based on the WebKit, which is the rendering engine that Apple uses for Safari. So basically if your site works on Safari it will work with Chrome. But does your site work on Safari? I would suspect there are many a smaller organisation (& probably a few big ones as well) who have only built their site to support IE, and maybe Firefox. A quick review of the major job boards in Australia should that Seek, CareerOne & MyCareer all work ok. On the corporate side of things PageUp, Taleo and NGA sites all seem to hold up as well. My next point is around privacy. Chrome allows user to browser without leaving a history on their personal desktop by using Incognito mode. But what is more interesting is the collection of data by Google. While they say it is only statistics but I have had reports, unconfirmed, that the URL you are browsing is sent back to Google to help the Googlebot know what to index. I will be using Chrome as my primary browser for the next week and will then decide if I should go back to Firefox. Will Chrome over take Firefox, Safari, Opera and Internet Explorer, like most things only time will tell. I missed the launch last year by the Great Place to Work Institute opened their doors downunder. Spearheading by Chris Taylor and Trish Dagg two organisational development types out of Western Australian university. There is no reference on the site as to how a company gets selected to participate in the process other than they “work with a respected Media Partner”, I guess is it was News Corp’s The Australian as the results were published there. However to make it on the list selection is primarily based on employees’ responses to a survey and then an evaluation of submitted content by the company. I am trying to get further information on the complete list. 2Vouch is a social recruiting system that pays professionals $1,400-$2,800 when they make referrals someone who gets hired. For companies, it is free to advertise. They only pay when they place someone through the system and we offer a 110% money back guarantee if the person doesn’t work out. The service is fundamentally similar to Hoojano which I spoke about back in February this year, with a few differences. Both basically rely on the refer a friend approach to filling roles. Employee referral programs are a very common approach used by many organisations and research has shown they are the lowest cost source for hiring in today’s marketplace, even lower than using job boards! In certain industries within the US best in class companies hire over 46% of employees through referral programs. Cost is not the only benefit research by Professor Emilio Castilla from MIT Sloan School of Management found that employees recruited through employee referral programs can have a higher performance over employees recruited through other means. But back to the tool. One of the biggest differences between Hoojano and 2Vouch are how they match jobs, although both would say otherwise. Where as Hoojano requires the member to actively review their contacts to find matches 2Vouch uses their Job Genie™ to email the member when possible jobs that match their contacts are available. Payment is only made on placement, not to advertise so there is no harm for recruiters and employers giving the tool a test run. Further 2Vouch is offering a 110% refund for recruiters and employers if they hire someone through the tool and they do not work out. While this might sound impressive I think 2Vouch will keep their money as research has shown internationally that placements made through referrals are of far higher quality than regular placements. Members get referral payments, ranging from AU$1,400 – AU$2,800 once someone has been successfully hired. These payments can be made to the members PayPal account or donated to charity. 2Vouch are ranked #26 in the Ross Dawson’s BRW Top 100 Web Applications, original development was completed by Ben Barren and his team from FeedCorp and have recently become part of the Pollenizer gang, Australia leading startup management garage, to create a very compelling tool for the Australian market. A final note, and a plug, as part of my work with Inspecht we have a research report available on building a business case for using referrals in hiring.